Home » Moral vs. Morale: What’s the Difference? If two words are spelled similarly, it can be tricky to remember which is which. That is the case with moral and morale. Both of these words can function as a noun in a sentence, but only one of them can function as an an adjective as well. Continue reading to find out which as which, and for help deciding whether the word you need is moral or morale. In this article, I will compare moral vs. morale. I will use each word in a sentence to demonstrate its proper use and function. Then, at the end, I will give you a useful trick to help remember whether to choose morale or moral for your writing. What does moral mean? Moral (pronounced morel) can be an adjective or a noun. As an adjective, moral means having the quality of virtuousness or rightness. A responsible attitude is the product of a moral upbringing. The moral choice would be to stop and offer assistance to the couple whose car has broken down. As a noun, moral refers to a standard of rightness or good conduct. My father is a man of good morals. You would clean up after yourself if you had any morals. In some cases, a moral can also be the lesson of a story, whether intended or unintended. The moral of the story is that you should never trust someone who stands to gain from your misfortune. One unintended moral of the children’s film The Little Mermaid is that women rely on the men in their lives to help them achieve true happiness. As you can see, in all of these uses, both as an adjective and as a noun, moral is used to refer to something good, something righteous, and something having to do with right and wrong. What does morale mean? Morale (pronounced mor-al) is also a noun. It refers to the attitude or confidence of a person or group. I bought my team donuts to improve morale. The army’s morale dropped precipitously when they learned that they would be invading Russia during the winter. Here is a helpful trick to remember morale vs. moral. If you are referring to the spirit or confidence of a person or group, use morale. This should be easy to remember since morale and confidence both end with the letter E.
In other instances, including the lessons of a story, a standard of rightness or moral conduct, or any time the word in question is an adjective, choose moral instead. Morale is never an adjective. Is it moral or morale? 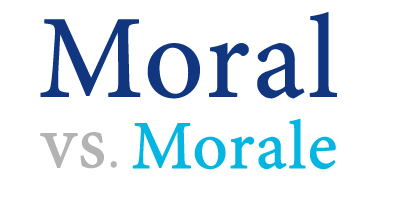 In this article, I discussed the differences between moral and morale, including demonstrations of each in a proper sentence. Moral is an adjective that refers to the quality of rightness or virtue. It is also a noun that refers to either a standard of rightness or good conduct, or the lesson of a story. Morale is a noun that means the spirit or confidence of a person or group. Since morale and confidence both end in the letter E, it should be easy to remember to reserve morale for this context. If you still need help, you can always reread this article for a refresher. 1 What is the Difference Between Moral and Morale?